If privacy and luxury are what you want on your spa vacation, then the Cotton House Spa is a great choice! Located on the remote island of Mustique near St. Vincent, it provides an array of treatments for men, women, teens and children. The spa is located on the beach with spectacular views of the sea. Seventeen distinct accommodations, many with private plunge pools, dot the hillside and sea-front of the estate. The structures reflect the old-Caribbean heritage, while giving modern comforts and luxury. The small, private island of Mustique is one of a group of islands called the Grenadines. The island is owned by the island's home owners, making it one of the most exclusive and sophisticated islands in the world. It covers 1,400 acres and it has several coral reefs. 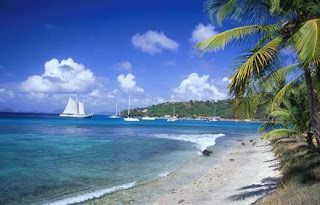 Mustique is such a peaceful island that even during peak season, there is little traffic, congestion or noise. Many of the roads are not paved and the island doesn't have that "commercialized" feeling. You may find yourself totally alone on its white sand beaches!